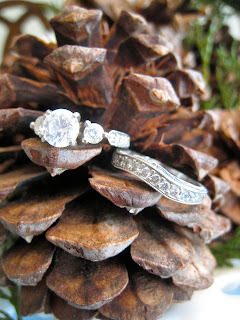 I cleaned my engagement ring and wedding band the other day for the first time in FOREVER, and they were so sparkly that I took a quick study break and ran around the house taking pictures of them with all of our Christmas decorations. Teehee. I love my rings, and I love Christmas decorations... so these are kind of like awesome photos to me. Haha! My favorites are the ones with the fabric and that first one on the evergreen branches. Has anyone else had a ring photo shoot lately?